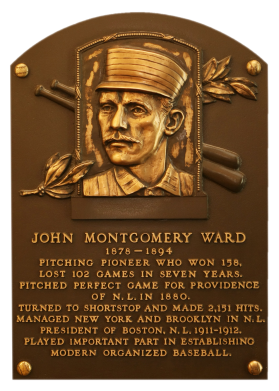 Perhaps no figure in baseball had distinguished himself in so many areas as did John Ward. 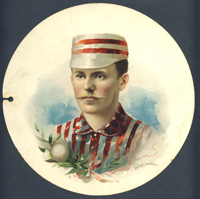 As a pitcher for Providence, he led the NL in ERA in 1878 and in wins in 1879. Switched to shortstop in 1885, he became the best in the league for New York. Unhappy with the reserve clause, in 1890 he helped from the Players' League. Becoming a manager, he led the Giants to a championship in 1894. Retiring at age 34 to practice law, Ward returned to the game as part-owner of the Braves in 1911. Comments: For a long time, Ward was covered by a 1990 Target Dodgers tribute card purchased in 2000 and graded PSA 8 in 2003. In January, 2009 I purchased a PSA 1 (MK) 1895 N300 card - an issue contemporary to Ward's career. It's a great image of John Ward and for some reason, I though the "Retired" caption was interesting. I already had some other Mayo's so I knew this was a placeholder until I could find another portrait. After some searching I decided a 1889 A35 was the best option - incredible picture. I almost pulled the trigger on a framed example in Baltimore - at The National in 2010. But, the price was a little steep. Then, in early 2011 a copy surfaced on eBay. Unfortunately, I completely forgot to register my snipe bid and lost out on the auction. The same card showed up in the Bagger's Auction a couple months later and I had to go after it. The price ended up higher then the final eBay sale price but I'm very happy to now own this 19th century piece. Description: As a mail-in redemption premium for 75 coupons from its Old Judge and Dog's Head cigarette brands, Goodwin offered this 12-page lithographed album. In an unusual 8-1/4" diameter format, the pages have a single hole punched at the side and are attached bya fancy tasseled cord allowing them to be fanned for viewing. Front and back covers of the album depict a baseball, with the inside covers advertising the cigarettes, as does the sixth page of the album. 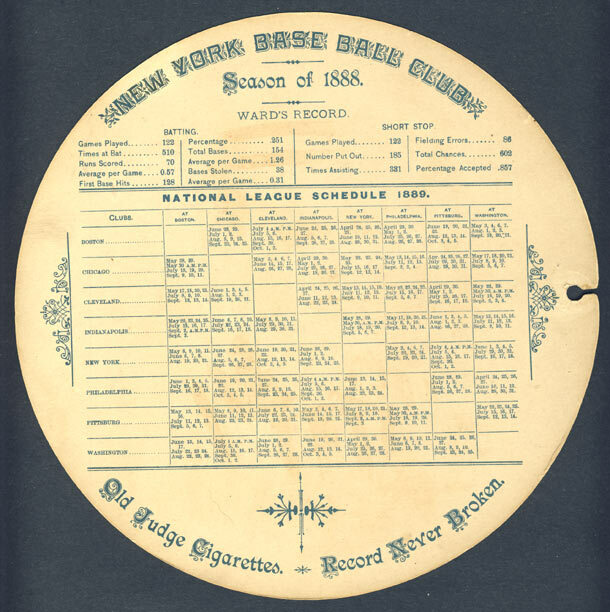 The nine other pages depict in vivid color either single stars of the game or groups of four players, with an emphasis on the N.Y. Giants champions of 1888. 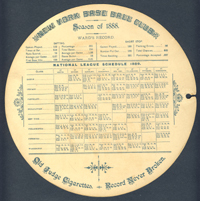 Backs of the pages offer player stats for the previous season and schedules for various leagues for 1889.